Konrad-Adenauer-Foundation (KAS) and Goethe Institute. How does the period of the Khmer Rouge influence the arts in Cambodia today? Please be our guest and participate in our discussions. 18 Cambodian and international artists reflect on the genocide. This exhibition will be followed by an intercultural dialogue project with the German artists Horst Hoheisel and Sebastian Brand – in cooperation with the Goethe Institute Bangkok. The two German artists Mr. Horst Hoheisel (www.horsthoheisel.net) und Sebastian Brandt went for an expedition to the unknown Cambodia. What is the present cultural identity of Cambodian people? In which kind does the gruesome heritage of the Khmer Rouge effect on their daily life and behavior? For this, the Germans kindly appeal to you to bring some small personal items (together with a short written statement about the item) to the Meta House (also anonymously), to get a collection of items, which symbolize Cambodian life and identity. This will be the basement for Hoheisels and Brandts art installation opening at February 12th. Beside this, the artists also focus on their own alien point of view through the subject of that project. Hoheisel focusses artistically on the German Holocaust and the National Socialist Movement. Jointly with Andreas Knits, he elaborated and produced new shapes of monuments, which became known as ‘counter-monuments’ (www.horsthoheisel.de). Besides the memory of open air landmarks, his works also belong to the patrimonies of several international museums (e.g. Museum of Modern Art, New York). Leni Riefenstahl’s (in)famous propaganda film chronicles the 1934 Nazi Party Congress in Nuremberg/Germany. Riefenstahl’s techniques, such as moving cameras, the use of telephoto lenses to create a distorted perspective, aerial photography, and revolutionary approach to the use of music and cinematography, have continued to influence movies, documentaries, commercials and music videos to this day, even as it raises the question over the dividing line between art and morality. In this semi-documentary Austrian filmmaker Roland Wehap describes the situation in a country which has, as a result of its political situation, fo a long time been isolated from the outside world, but which is now slowly opening for tourism. Back from a pleasant 850km bike ride and ready to spread news about some events! Welp, back to work. Cheers! pps. I am looking for a new apartmento – sub $200 if possible. Know of anything fun going on in Phnom Penh? And of course a BIG thank you to everyone who let me know about events! …..and that’s what the show is. 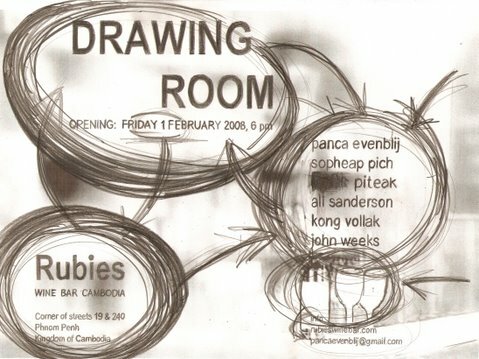 You are currently browsing the Sang Salapak Building Arts blog archives for January, 2008.